Marvel Animation, Inc. is an American animation production company. The Marvel Entertainment subsidiary was incorporated on January 25, 2008 to direct Marvel's efforts in animation and home entertainment markets. The incorporated Marvel Animation included then ongoing animation efforts by Marvel Studios with Lionsgate and Nickelodeon. Marvel Animation operates under the Marvel Television division of Marvel Entertainment, LLC, a subsidiary of The Walt Disney Company. Marvel Comics Group first entered the animated field through licensing to Grantray-Lawrence Animation for The Marvel Super Heroes anthology series in 1966. Marvel worked with Grantray-Lawrence, Hanna-Barbera and DePatie–Freleng Enterprises on other animated series until 1980. In 1980, Cadence Industries would purchase the remainder of DePatie–Freleng Enterprises to form Marvel Productions. Marvel Productions was merged into New World Entertainment's operations with the Marvel Entertainment Group's sale to Andrews Group, a Perlman corporation, in 1989. Marvel Productions became New World Animation by 1993. Marvel Entertainment Group then set up a division, Marvel Films, to work with New World Entertainment's New World Family Filmworks, Inc., both under Avi Arad as president. Marvel Films Animation was set up and produced only a single show, Spider-Man in 1994. During this time, New World Animation and Saban Entertainment produced additional shows, with Saban eventually taking over production. In August 1996, Marvel Entertainment Group decided to incorporate Marvel Films as Marvel Studios with the sale of New World Communications Group, Inc., Marvel's fellow Andrews Group subsidiary in film and television stations, funded with a sale of Toy Biz stock. In 2004, Marvel Entertainment, Marvel Comics's new parent corporation, struck a deal with Lions Gate Entertainment to produce a series of eight direct-to-video animated movies under the name of Marvel Animated Features in conjunction with Marvel Studios, Marvel's direct film subsidiary. Eric Rollman was hired by Marvel as Executive Vice President, Home Entertainment & TV Production for Marvel Studios to oversee the deal with Lionsgate. Marvel Animation was incorporated in January 2008 to direct Marvel's efforts in animation and home entertainment markets including then animation efforts with Lionsgate and Nickelodeon. Marvel Entertainment named Eric Rollman as president of the company in April 2008. In early 2009, a home distribution deal for The Super Hero Squad Show was inked with Shout! Factory. In April 2009, the Marvel Knights Animation series was announced to be under development with Shout! Factory developing hybrid comic animation DVD series by converting existing material. On December 31, 2009, The Walt Disney Company purchased Marvel Animation with parent company Marvel Studios as part of the Marvel Entertainment group for $4 billion. Both Marvel and Disney have stated that the merger will not affect any preexisting deals with Lionsgate or other production companies for the time being, although Disney said they will consider distributing future Marvel Animation projects with their own studios once the current deals expire. With the creation of the Marvel Television division in June 2010 within Marvel Studios, Marvel Animation will operate under Marvel TV's direction. In July 2010, Marvel entered into Superhero Anime Partners with Madhouse and Sony Pictures Entertainment Japan to develop and produce the Marvel Anime project that took famous Marvel characters and reintroduced them for a Japanese audience in four 12-part television series which aired on Animax in Japan and G4 in the United States. In 2012, Marvel established its Marvel Animation Studios based in Glendale, California under Senior Vice President Eric Radomski. On April 1, Disney XD launched a block called Marvel Universe, with the premiere of Ultimate Spider-Man, followed by the returning The Avengers: Earth's Mightiest Heroes. The block is a result of Disney's 2009 Marvel acquisition. In June, Walt Disney Animation Studios announced they were in development with Marvel to make a film of Big Hero 6. At San Diego Comic-Con in July, Marvel Television announced a second "season" of Marvel Knights Animation with Shout Factory and the involved titles. Following up on early anime productions in the Superhero Anime Partners, Marvel has re-partnered with Madhouse and Sony Pictures Entertainment Japan as SH DTV Partners for a direct to video anime feature film, Iron Man: Rise of Technovore. Also in October, Marvel Animation Studios announced its first DTV production, a direct to video film, Iron Man & Hulk: Heroes United, to be released in 2013. Marvel announced in May 2013, that the new shows, Avengers Assemble and Hulk and the Agents of S.M.A.S.H., would be shown on Disney XD as part of the Marvel Universe block and would be a part of the same fictional universe. In October, Marvel announced that Disney Japan was producing a new anime television show with Toei Animation called Marvel Disk Wars: The Avengers to be aired on April 2, 2014 on TV Tokyo and other TXN stations. A Guardians of the Galaxy animated series was officially announced in October 2014, with production set to begin for a 2015 release on Disney XD. In August 2015, Marvel Studios was integrated into the Walt Disney Studios, while Marvel Television and Animation were left under Marvel Entertainment and Perlmutter's control. Marvel announced a new anime television series titled, Marvel Future Avengers, that is set to be broadcast in mid-2017 on the Disney satellite channel, Dlife. Marvel Entertainment announced a new pre-school franchise, Marvel Super Hero Adventures, in September 2017 consisting of a 10 short-form episodes animated series along with publishing and merchandise during "Marvel Mania" October. In the publishing field, Marvel Press issuing early reader chapter books in September and of course from Marvel Comics a five-issue miniseries in April 2018. Super Hero Adventures has Spider-Man teaming with another Marvel hero. The animated episodes lasting 3-and-a-half minutes aired on Disney Channel's Disney Junior block followed by Disney Junior channel then Marvel HQ YouTube channel and DisneyNOW app. On December 7, 2017, Marvel announced its Marvel Rising franchise focusing on new characters as youngsters starting with animation in 2018 with Ghost-Spider, a renamed Spider-Gwen, shorts and an animated film, Marvel Rising: Secret Warriors. In February 2019, Hulu ordered adult animated Marvel series based on MODOK, Hit-Monkey, Tigra and Dazzler and Howard the Duck, leading up to a crossover special titled The Offenders. All Marvel Animated Features films that have been released or announced have been produced by MLG Productions, Marvel & Lionsgate's subsidiary group, and have been released direct-to-video by Lionsgate. The contract Marvel had with Lionsgate was for eight films, all of which have been released as of 2011. Marvel Knights Animation is a hybrid comic-animation series. Episodes have been released on iTunes digitally and physically through Shout! Factory on DVD. ^ Hamilton, Jeff (January 15, 2014). "CONDITIONAL USE PERMIT CASE NO. PCUP 1326237" (PDF). ci.glendale.ca.us. CITY OF GLENDALE COMMUNITY DEVELOPMENT DEPARTMENT. p. 10. Retrieved December 28, 2016. ^ "Our Studio List". animationguild.org. Animation Guild. Retrieved December 28, 2016. ^ a b "D23′s How We Do It: Marvel Animation Studios". News & Features. D23 - Disney Official Fan Club. Retrieved September 12, 2012. ^ George, Richard (June 28, 2010). "Marvel Creates New TV Division". IGN. Ziff Davis. Retrieved May 18, 2012. ^ a b c Phegley, Kiel (July 2, 2010). "Jeph Loeb Talks Marvel TV". comicbookresources.com. Retrieved July 13, 2011. ^ a b c Sands, Rich (June 12, 2012). "Exclusive: Marvel Assembles New Animated Series for the Hulk and Avengers". TV Guide. Retrieved July 5, 2012. ^ a b Breznican, Anthony (October 4, 2012). "'Iron Man & Hulk: Heroes United': First Look at Marvel Animation's debut movie -- EXCLUSIVE". Entertainment Weekly. Retrieved October 10, 2012. ^ Marvel Animation Entity Information. Corporation & Business Entity Database. Division of Corporations, State Records and Uniform Commercial Code. New York State Department of State. Accessed on November 11, 2013. ^ a b c "Marvel Promotes Eric Rollman To President, Marvel Animation". AWN Headline News. Archived from the original on January 25, 2009. Retrieved May 6, 2008. ^ a b "MARVEL ANIMATION, INC". Division of Corporations Entity database. Archived from the original on September 29, 2007. Retrieved May 6, 2008. ^ "Marvel Grows into $100 Hulk". Variety. September 17, 1986. p. 92. Archived from the original (jpeg) on July 20, 2013. Retrieved October 18, 2011. ^ Mangel, Andy (May 1991). "Reel Marvel". In Jim Salicrup (ed.). Marvel Age Issue 100. Marvel Comics. Retrieved October 25, 2011. ^ a b Hicks, Jonathan (November 8, 1988). 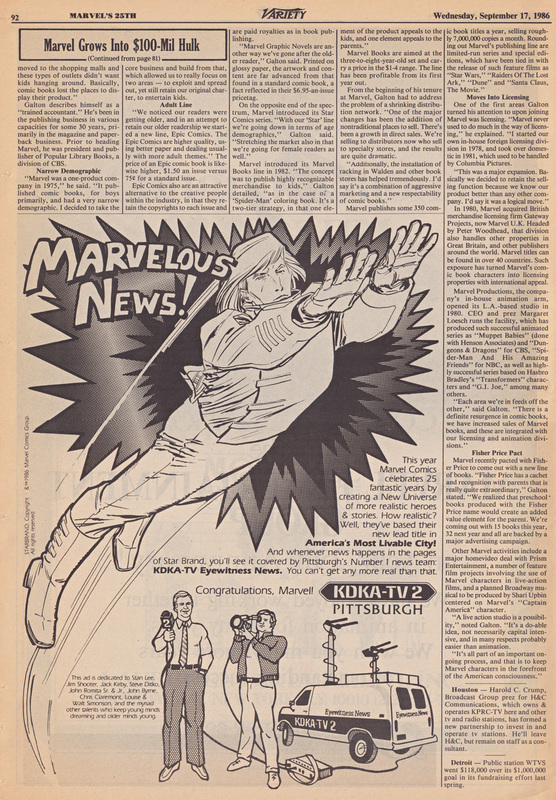 "THE MEDIA BUSINESS; Marvel Comic Book Unit Being Sold for $82.5 Million". New York Times. Retrieved May 5, 2011. ^ a b "John Semper on "Spider-Man": 10th Anniversary Interview". Marvel Animation Age. toonzone.net. Archived from the original on May 14, 2011. Retrieved May 5, 2011. The show was canceled and, as she had intended, the studio, Marvel Films Animation, went out of business. ^ a b Cawley, John. "Marvel Films Animation 1993-1997". Home of John Cawley. Archived from the original on May 22, 2012. Retrieved May 5, 2011. Hence Bob discovered he was not only going to produce the first series from Marvel Films Animation, he was also going to have to build the studio from scratch! ^ a b c Harvey, James. "Direct-To-Video "Marvel Animated Features" Line Plans For Future Releases". Marvel Animation Age. toonzone.net. Retrieved April 1, 2011. ^ a b c Brooks, Tamara. "Shout! Factory, Marvel Animation team up for 'Marvel Knights' on DVD". Misfits of Scifi. Retrieved March 29, 2011. ^ Vejvoda, Jim (August 31, 2009). "The Disney/Marvel Deal: What It Means for Movies". IGN. Ziff Davis. Retrieved July 13, 2011. ^ Fixmer, Andy; Rabil, Sarah (September 1, 2009). "Disney's Marvel Buy Traps Hollywood in Spider-Man Web (Update2)". Bloomberg. Retrieved July 13, 2011. ^ a b "コピーライト一覧 (Copyright List)". marvel-japan.com. Marvel Japan. Retrieved May 1, 2013. ^ "Blade / Superhero Anime Partners, Sony Pictures Entertainment Japan, Madhouse ; written by Kenta Fukasaku ... [et al.] ; directed by Mitsuyuki Masuhara ... [et al.]". National Library of Australia. Retrieved January 23, 2014. ^ Breznican, Anthony (June 29, 2012). "Disney Animation teams up with Marvel for 'Big Hero 6'". Entertainment Weekly. Time Inc. Retrieved October 10, 2012. ^ a b Wheeler, Andrew (July 17, 2012). "Marvel Television Presents: Animated Hulks, Animated Avengers, and Marvel Knights Season Two [SDCC]". comicsalliance.com. Archived from the original on September 18, 2012. Retrieved April 17, 2013. ^ a b "Marvel and Sony Announce New IRON MAN Animated Feature". newsarama.com. Retrieved October 8, 2012. ^ a b "Madhouse, Marvel Team Up Again for New Iron Man: Rise of Technovore Film". AnimeNewsNetwork.com. October 8, 2012. Retrieved October 10, 2012. ^ a b "Marvel Calls "Avengers Assemble" On DisneyXD". May 23, 2013. Archived from the original on September 27, 2013. Retrieved June 9, 2013. ^ Goldman, Eric. (October 23, 2013) Japanese Anime Series Marvel Disk Wars: The Avengers Announced. ign.com. Accessed on October 25, 2013. ^ 最新アニメーション「ディスク・ウォーズ：アベンジャーズ」テレビ東京系6局ネットにて4月より放送開始！. marvel-japan.com (in Japanese). Marvel Japan. January 15, 2014. Retrieved January 17, 2014. ^ Barnes, Brooks (October 10, 2014). "'Guardians of the Galaxy' TV Show Is Latest Hope for Disney XD Channel". The New York Times. The New York Times Company. Archived from the original on October 10, 2014. Retrieved October 10, 2014. ^ Masters, Kim; Belloni, Matthew (August 31, 2015). "Marvel Shake-Up: Film Chief Kevin Feige Breaks Free of CEO Ike Perlmutter (Exclusive)". The Hollywood Reporter. Retrieved August 31, 2015. ^ "Marvel creates a new Japanese original TV anime "Marvel Future Avengers" produced! Broadcast this summer". Animate Times (in Japanese). Animate Lab. February 27, 2017. Retrieved February 27, 2017. Translation. ^ a b c McMillan, Graeme (September 7, 2017). "Marvel Launches Multiplatform 'Super Hero Adventures' Preschooler Program (Exclusive)". The Hollywood Reporter. Prometheus Global Media. Retrieved February 17, 2018. ^ Whyte, Alexandra (September 8, 2017). "Marvel swings into preschool content". Kidscreen. Brunico Communications Ltd. Retrieved February 17, 2018. ^ Hill, Jacob (January 18, 2018). "Marvel to Launch All-Ages Super Hero Adventures Comic". CBR. Retrieved February 17, 2018. ^ a b Napoli, Jessica (October 12, 2017). "First Look: 'Marvel Super Hero Adventures' Stars Spider-Man and Other Heroes in Preschooler-Focused Series". TV Insider. Retrieved February 17, 2018. ^ a b c McMillan, Graeme (December 7, 2017). "Marvel Launching Animated Property 'Marvel Rising' in 2018". The Hollywood Reporter. Retrieved December 7, 2017. ^ a b c Otterson, Joe (February 11, 2019). "'Howard the Duck' Among Four Marvel Animated Shows Ordered at Hulu". Variety. Retrieved February 11, 2019. ^ DeMott, Rick (December 3, 2007). "Ratatouille Cooks Up Most Annie Nominations". AWN News. Retrieved March 29, 2011. ^ "MARVEL ANIMATION: THE FUTURE". Comics Continuum. Comics Continuum. Retrieved May 18, 2011. ^ a b "Thor Animated Series Storms TV in 2010". Marvel.com. November 14, 2008. Retrieved June 2, 2013. ^ a b "Wolverine, Iron Man To Nicktoons". AWN, Inc. March 18, 2008. Archived from the original on May 13, 2006. Retrieved May 28, 2008. ^ a b "The Avengers: Earth's Mightiest Heroes Premieres Oct. 20". Superhero Hype!. September 20, 2010. Retrieved September 21, 2010. ^ a b "Animated Ultimate Spider-Man Coming to Disney XD". Superhero Hype. April 13, 2010. Retrieved September 28, 2011. ^ a b c "Marvel, circus company join forces for superhero arena show". Los Angeles Times. March 13, 2013. Retrieved May 11, 2013. ^ Milligan, Mercedes (April 18, 2012). "Dushku is She-Hulk in New Disney XD Show". Animation Magazine. Retrieved October 26, 2015. ^ "Marvel announces new 'Guardians of the Galaxy' animated series". Entertainment Weekly. July 26, 2014. Retrieved July 28, 2014. ^ Goldman, Eric (March 22, 2017). "Marvel's Rocket and Groot Have Trouble at a Fancy Restaurant in a New Animated Short". IGN. Retrieved June 12, 2017. ^ "SDCC: Marvel Animation Promises New Team-Ups, "Secret Wars," Rocket and Groot Shorts & More". comicbookresources.com. July 26, 2016. Retrieved July 29, 2016. ^ Butler, Mary Anne. "Disney Releases Teaser For Animated Ant-Man Short On Disney XD". Bleeding Cool News And Rumors. Retrieved June 12, 2017. ^ Pepose, David (October 8, 2016). "NYCC '16: MARVEL Animation Presents To Announce New Project". Newsarama. Retrieved December 23, 2016. ^ "Marvel's Spider-Man: Animated Series To Premiere On Disney XD In 2017 — NY Comic-Con". Deadline Hollywood. Penske Media Corporation. October 8, 2016. Retrieved October 8, 2016. ^ a b Holub, Christian (July 16, 2018). "'Marvel Rising' aims to create superhero stories for a new generation of female fans". Entertainment Weekly. Meredith Corporation. Retrieved July 17, 2018. ^ "'Marvel's Moon Girl And Devil Dinosaur' Animated Series Produced By Laurence Fishburne In Works At Disney Channels". Deadline Hollywood. Penske Media Corporation. February 20, 2018. Retrieved March 1, 2018. ^ Whyte, Alexandra (August 13, 2018). "Marvel teams up with Young Storytellers". Kidscreen. Retrieved August 15, 2018. ^ a b Sorrentino, Mike (October 2, 2018). "Iron Man Riri Williams is making her animated debut in Marvel Rising". CNET. Retrieved October 2, 2018. ^ Dominguez, Noah (January 14, 2019). "Marvel Rising: Secret Warriors & Ghost-Spider Team Up in Chasing Ghosts Trailer". CBR. Retrieved January 15, 2019. ^ "Ultimate Avengers - The Movie - DVD Sales". The Numbers. Nash Information Services, LLC. Retrieved August 8, 2014. ^ "Ultimate Avengers 2: Rise of the Panther - DVD Sales". The Numbers. Nash Information Services, LLC. Retrieved August 8, 2014. ^ "The Invincible Iron Man - DVD Sales". The Numbers. Nash Information Services, LLC. Retrieved August 8, 2014. ^ "Doctor Strange - DVD Sales". The Numbers. Nash Information Services, LLC. Retrieved August 8, 2014. ^ "The Next Avengers: Heroes of Tomorrow - DVD Sales". The Numbers. Nash Information Services, LLC. Retrieved August 8, 2014. ^ "Hulk VS. - DVD Sales". The Numbers. Nash Information Services, LLC. Retrieved July 10, 2012. ^ "Planet Hulk - DVD Sales". The Numbers. Nash Information Services, LLC. Retrieved August 8, 2014. ^ "Thor: Tales of Asgard - DVD Sales". The Numbers. Nash Information Services, LLC. Retrieved August 8, 2014. ^ "Iron Man and Hulk: Heroes United". The Numbers. Nash Information Services, LLC. Retrieved October 12, 2014. ^ "Avengers Confidential Black Widow & Punisher". The Numbers.com. Nash Information Services, LLC. Retrieved August 8, 2014. ^ Labrecque, Jeff (July 25, 2014). "Iron Man and Captain America make a wager in new 'Heroes United' movie". Entertainment Weekly. Time Inc. Retrieved July 26, 2014. ^ "Marvel's Super Hero Adventures: Frost Fight Clip: Loki Fights Captain America". IGN. Ziff-Davis. November 19, 2015. Retrieved September 11, 2016. ^ "Spider-Woman: Agent Of S.W.O.R.D." Shout! Factory. June 14, 2011. Retrieved June 12, 2017. ^ a b Duncan, Phillip. "Shout! Factory to Release Astonishing X-Men and Iron Man – Extremis DVDs". superheroes-r-us.com. Archived from the original on July 25, 2011. Retrieved March 30, 2011. ^ Langshaw, Mark. "'Black Panther' animation dated". Digital Spy.com. Digital Spy Limited. Retrieved March 30, 2011. ^ Ayres, Tom. "Marvel announces 'Thor & Loki' TV series". digitalspy.com. Digital Spy Limited. Retrieved March 30, 2011. ^ "Astonishing X-Men: Dangerous". Shout! Factory. April 10, 2012. Retrieved June 12, 2017. ^ "Astonishing X-Men: Torn". Shout! Factory. August 14, 2012. Retrieved June 12, 2017. ^ "Astonishing X-Men: Unstoppable". Shout! Factory. November 13, 2012. Retrieved June 12, 2017. ^ a b "Ultimate Wolverine Vs. Hulk". Shout! Factory. September 10, 2013. Retrieved June 12, 2017. ^ "Wolverine: Origin". Shout! Factory. July 9, 2013. Retrieved June 12, 2017. ^ "Wolverine Versus Sabretooth". Shout! Factory. January 14, 2014. Retrieved June 12, 2017. ^ "Wolverine Weapon X: Tomorrow Dies Today". Shout! Factory. May 13, 2014. Retrieved June 12, 2017. ^ "Eternals". Shout! Factory. September 16, 2014. Retrieved June 12, 2017. ^ "Wolverine Versus Sabretooth: Reborn". Shout! Factory. March 24, 2015. Retrieved June 12, 2017. This page was last edited on 6 April 2019, at 05:47 (UTC).